There’s a famous quote of Louis Pasteur which says “fortune favors the prepared mind”. There’s also another thought along that line that goes “It”s better to be lucky than good”. Sometimes those conflicting ideas cross paths. I think that’s happened on the night I made this photograph. I’ve made images of star trails using long exposures ( one hour ) on film. This time I was trying to photograph the Milky Way using shorter time frames ( 15 seconds to 20 seconds ) on a digital camera. 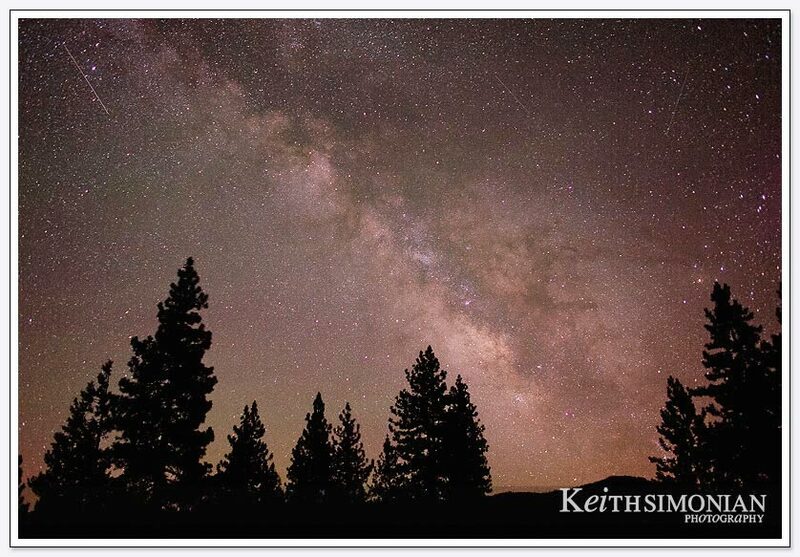 As I was away from the city lights here in the SF Bay Area and at an elevation of about 5,100 feet just outside the city of Johnsville, CA, they sky was clear and just waiting for me to capture the Milky Way. What I wasn’t expecting to capture that evening in this particular frame was 3 meteors. In the twenty or so other photos I made that night, there were two other photos that captured one meteor in each photo. This one captured three meteors during the 20 second exposure with the brightest being on the far upper left, and the least brightest being on the far upper right of the image. Image details – Canon 5D on tripod – ISO 1250 – 20 second exposure – 24mm lens at f2.0 – 10:22 PM – just outside Johnsville, CA population 20.